Are you planning for retirement in the near future or are you curious how the Social Security system works and what’s available for you? 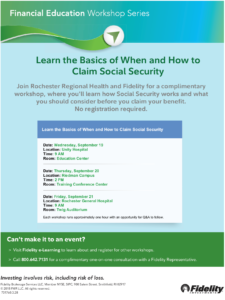 Fidelity Investments will be on-site at RRH next week to explain the basics of when and how to collect Social Security benefits. Click on the link below for times and locations. Posted September 13, 2018 under _Featured Stories List, Locations, News.